A tether for electronic devices employing a plug having a first end adapted for engagement to a tether and a second end formed on non-conductive material having an exterior surface with an exterior circumference adapted for frictional engagement with the interior circumference of an electrical socket. The second end can be formed of compressible material having an exterior circumference slightly larger than the socket for a biased engagement. An axial void can also be provided to accommodate projections in the socket or to engage an antenna. This device solves the costly repair or replacement issues of either dropping or losing your cell phone, Sidekick, or other electronic device and either cracking or breaking your cell phone face plate or screen and having to pay the $20.00 to $250.00 repair bill to fix your cell phone, or the $900.00 plus to replace your lost cell phone. This device does not require any built in attachment points as such, but only the universal entry ports found on all cell phones or other electronic devices. This device is compatible with any cell phone case, and with all flip up phones. No matter how "armoured" your cell phone case is , that cell phone case can still be lost or damaged if dropped while white water rafting or dropped while rock climbing.This device does not conduct electricity, and will not damage the electronics on any electronic device that the socket is plugged into. This device is designed to hold any dropped cell phone via friction and or compression. This device saves the user up to the $1,200.00 that some people are paying for "cell phone insurance", that some companies try to push on cell phone buyers. This device will keep male and female bicyclists from the problem(s) of having their cell phone's "pop out" of their bicycle short's when riding for fun or work. I am looking for either an outright sale, a license with royalties or another form of partnership. This device has not been previously sold or marketed. There are no specific conditions for the sale of this device. The market potential for this device is tremendous due to the ease of production and the simplicity of the product. With 3-D printing becoming the norm ,this device could easily have a prototype produced and tested by any company or individual. 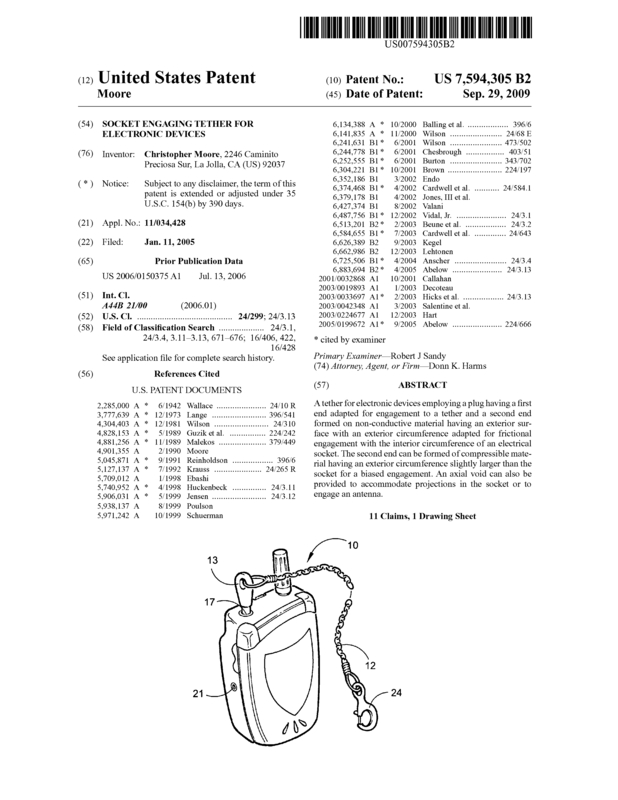 Page created at 2019-04-25 10:02:18, Patent Auction Time.